Since Brexit was announced this 1992 / 1993 EC Presidency 50p coin has shot up in value, doubling in a few months. No items matching the keyword phrase "EC Presidency 50p -copy -replica" were found. This could be due to the keyword phrase used, or could mean your server is unable to communicate with Ebays RSS2 Server. No items matching the keyword phrase "EC Presidency 50p +silver +proof -copy -replica" were found. This could be due to the keyword phrase used, or could mean your server is unable to communicate with Ebays RSS2 Server. 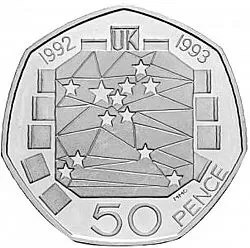 The EC 50 pence piece 1992 date commemorates the United Kingdom's Presidency of the Council of Ministers and the completion of the Single European Market. The attractive and unusual design represents a conference table with 12 chairs of the Council of Minister around. The EC 50P 1992 1993 is the first dual-dated coin and is Britain's rarest decimal circulated coin (rarer than the Kew Gardens 50p). Just 109,000 coins were struck which is half of the Kew Gardens 50p mintage. The new interest has also prompted FAKE EC Presidency 50p coins to appear on eBay. When you are buying online look for word like "copy" or "replica coin "in the Seller's item title or description or ask the question outright. If it is a Silver Proof coin from The Royal Mint, then it should be accompanied by an official COA (Certificate of Authenticity). We suppose these can be faked too! We have seen "replica coins" selling for £20 so take the time to check exactly what you are being sold by reading the title and description carefully. The Silver Proof EC Presidency was struck in Sterling (.925 ounce) from silver of the finest proof quality with only 35,000 coins available worldwide. If you can afford the Silver proof proof version of this coin, try to buy one it it's presentation box and with a Certificate of Authenticity (COA). No items matching the keyword phrase "1992 ec presidency +silver+proof" were found. This could be due to the keyword phrase used, or could mean your server is unable to communicate with Ebays RSS2 Server.